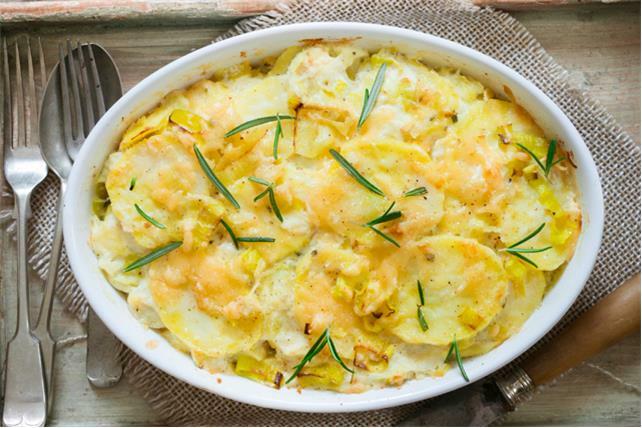 Our Cheesy Scalloped Potato and Leek Casserole recipe has everything you love about velvety, tender, crunchy-topped scalloped potatoes but switches up the flavour with delicate, tender leeks and fresh rosemary. This cheesy potato casserole is everything you want in a potato side dish… and more! Whip it up for any special occasion, whether it's during the holiday season, for Thanksgiving, or just a cozy Sunday dinner with family. Melt butter in Dutch oven or large saucepan on medium-low heat. Add garlic; cook and stir 1 min. Whisk in flour; cook 3 min. or until hot and bubbly, stirring constantly. Gradually add milk, mixing well after each addition. Cook on medium heat 4 min. or until thickened, stirring constantly. Add shredded cheese; cook and stir 2 to 3 min. or until melted. Remove from heat. Stir in rosemary. Place half the potatoes in 3-L casserole dish sprayed with cooking spray; top with layers of leeks, remaining potatoes and cheese sauce. Cover. Bake 45 min. Top with Parmesan; bake, uncovered, 15 min. or until potatoes are tender and top is golden brown. This delicious, comfort-food casserole can be baked ahead of time. Cool, then cover with foil and refrigerate up to 24 hours. When ready to serve, bake, covered, in 350ºF oven 30 min. or until heated through, uncovering for the last 10 min. Add extra rosemary for garnishing.